NES The Legend of Zelda (USA,PRG0) in 25:28.6 by Phil. 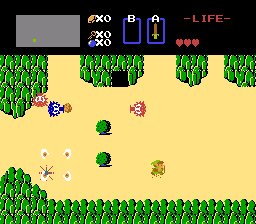 Legend of Zelda (ゼルダの伝説) is an adventure game that easily takes you days to beat. Its world is so huge and full of obscure secrets that without great deal of planning you won't make it in less than many hours. The previous Zelda movie which was designed together by many masterminds at the Nesvideos forums and played by Sleepz has now been beaten by Phil by 86 seconds because of tactical changes mostly. The Up+A trick (save and restart) was used in this movie several times. It was judged to be acceptable because it's mentioned in the instruction booklet of the game, and is a part of normal playing.